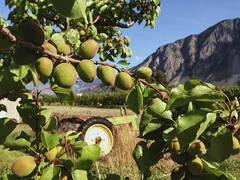 Parsons Apricots at the end of April, 2016. Hello and welcome back to Parsons Farm Market! We are now open for the season, from 8am – 6pm daily for all your market needs, so come on by! 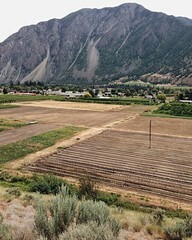 We’re a scenic 3-4 hour drive from the Lower Mainland, and even closer if you are already in the Okanagan. If one word sums up conditions in the Similkameen Valley this year, that word is EARLY. After a banner year in 2015 with harvest times brought forward by a dry winter and warm spring, this year is even more dramatic. It’s mid-June and we are already picking cherries and watching our apricots blush in the sun. If things continue, you can expect an early year for all our crops — this could even become the earliest year on record for peaches! 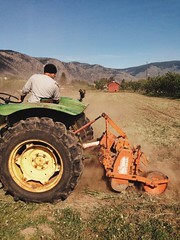 Our ground crop planting has increased significantly with heirloom tomatoes all the way back to the bench, rows of garlic putting in their time underground and that beautiful Similkameen soil nurturing a variety of seed on the way to becoming your farm fresh food. While we have more ‘coming on’ than usual right now, the summer will be a little more balanced, and you can rest assured there will be high-quality farm produce and tree fruit available all summer long. Curious about expected harvest times and what’s picking? Please email us or call us at (+1) 250.499.2312 for the latest updates. For opening day we are stocked with cherries freshly picked from our orchard, garlic scapes and kale from the farm and a new selection of Parsons Unique Products developed over the winter. Every day we see progress in the field and more fruit & veg is getting ready to pick. As the season matures, we produce even more packaged product – jellies, preserves, pickles, dried goods and much more, all in tune with our harvest and farm season. Our selection of BC produce is sourced to meet the high standards we set here at the market and to compliment our 15-acre farm’s bounty. 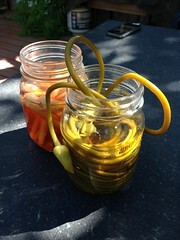 Parsons Farm Market is the perfect stop as you travel the Similkameen and Okanagan this summer. We have ample parking for all vehicles, ice cream, smoothies and shakes, hot buttered corn, prepared snacks and drinks and all the fresh fruits and vegetables you can handle! Your visit will be wrapped up in some valley history as one of the first fruit stands in the valley — a Keremeos original since 1908! That’s right, we’re celebrating the big 108 this year! Quentin……The garlic scape salt is undescribable…..trying not to eat alone as a snack as per your instructions…plus thanks for the cherries opening day. Your mom’s cousin son. See you soon.